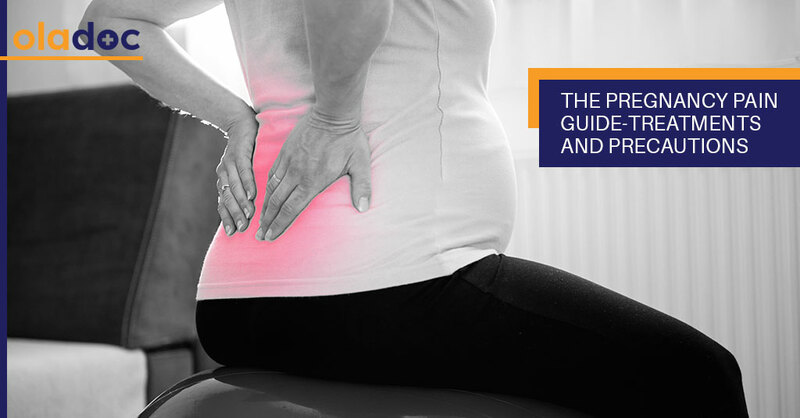 Pain during pregnancy is completely normal and can be due to various causes. However, this does not necessarily mean that you have to grin and bear it. There are multiple home remedies and precautions that can help treat and prevent mild-moderate pain from. While pregnant women should generally refrain from taking any unprescribed medications, OTC Acetaminophen is perfectly safe for instant mild pain relief during pregnancy. However, avoid Nonsteroidal Anti-Inflammatory Drugs or Painkillers (NSAIDS) like ibuprofen and naproxen, as they may cause heart problems and other birth defects in your baby, especially when taken after 30 weeks. In some cases, alternative painkillers or muscle relaxants may also be prescribed for moderate pain treatment. Regular physical activity not only boosts general health and fetal growth, but also strengthens the back and abdominal (core) muscles. This not only effectively reduces pain, but can also be helpful during childbirth. Strengthening, low-resistance exercises like walking, stationary cycling, swimming, and prenatal yoga are considered the safest during pregnancy. Work with your doctor or physical therapist (in case of chronic pre-pregnancy back pain) to determine the best exercises for you and develop an exercise plan. Learn about the best exercises during the first trimester here. For abdominal pain, try soaking in a warm bath or applying a heating pad to the painful area. However, wrap the heating pad in a towel to avoid burns and any accidental damage to the baby. In case of lower-back pain, first apply a cold compress wrapped in a towel over the painful area for 10-20 minutes, multiple times daily for 2-3 days. Then switch to a heating pad or hot water bottle, and repeat as with the cold compress for 2-3 days for optimum pain relief. Weight gain, along with increasing size of the uterus will put pressure on your spine. So try to minimize the back pain and pressure by practicing and retaining proper posture. Avoid slouching while working, sitting, and standing, as it only further strains the spine. You can also try placing a rolled-up towel behind your back, and resting your feet on a stool to reduce spinal pressure while sitting. Also, sleeping on your side with a pillow between your knees will also take the stress off your back and provide pain relief. Round ligament pain in the abdomen occurs when the two ligaments supporting the uterus stretch as the uterus grows. To reduce or eliminate the pain, bend and flex your hips if you detect a sneeze or cough coming on to keep the ligaments from stretching further. Change positions slowly, like standing up from sitting and vice versa, to prevent stretching the already strained muscles and ligaments. Sleep on your side instead of on your back, and use a firm mattress. Consider wearing a support belt for intense back pain. Avoid high-heeled shoes, and consider trying specially designed shoes and shoe inserts for pregnant women. Try an elastic sling or pregnancy girdle for abdominal support. Avoid standing for longer periods. Abdominal and back pain during pregnancy are generally not a cause for concern and can easily be resolved with proper care. However, consult with your doctor immediately if the pain intensifies, occurs frequently, and/or is accompanied by vaginal discharge and bleeding, or fever. You can also book an appointment with a top Gynecologist in in Lahore, Karachi and Islamabad through oladoc.com, or call our helpline at 042-3890-0939 for assistance to find the RIGHT Doctor for your health concerns.